[AMISTAD]. 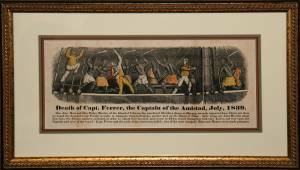 Broadside Print, Death of Capt. Ferrer, the Captain of the Amistad, July, 1839. Original hand coloring. Originally appeared with an 1840 New Haven Pamphlet, A History of the Amistad Captives...Also An Account of the Trials. On July 2, 1839, slaves aboard the Spanish schooner Amistad staged a revolt off the coast of Cuba, killing Captain Ramon Ferrer and the ship’s cook. They were taken into custody by the United States’ Navy near Long Island on August 26 and brought to Connecticut. Charges were filed alleging mutiny and murder, but the Circuit Court ruled that it lacked jurisdiction because the mutiny had occurred on a Spanish ship in Spanish waters. Various parties then filed property claims to the slaves, and the Spanish government asked that the ship, cargo and slaves be restored to Spain under the Pinckney Treaty of 1795. In 1840, a federal trial found that the initial transport (not involving the Amistad) of the Africans across the Atlantic had been illegal and that they were not legally slaves but free. The U.S. Supreme Court [case 40 U.S. (15 Pet.) 215] affirmed this finding on March 9, 1841, and the men were returned to Africa in 1842.